There are going to be a lot of Lightning Deals today you will not want to miss. This is one of them if the Xbox is on your list. 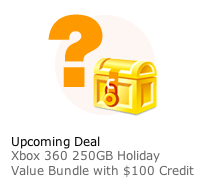 Amazon.com is going to have the Xbox 360 250GB holiday bundle as one of those Lightning Deals. We won’t know the final price until 9:00am but we do know they are offering $100 Amazon credit with this purchase. Make sure you have the Amazon.com page open and your browser refreshed at 8:59am. They don’t call this a Lightning Deal for nothing!